When the harvest moon shines, the faint memory of a nation of local farms celebrating another season of abundance lingers in the air. But now in a growing number of locations, it may be more than just a vision of long ago. More often now, if we turn the corner, the farm is real. Perhaps it is Singing Brook Farm in Worthington, Massachusetts, where Mariam Massaro tends certified organic herb, vegetable and flower gardens on less than an acre. Or maybe its Robert Farr’s ten-acre sustainable farm in Loudoun County, Virginia, where his family grows nearly 70 varieties of peppers and other fruits and vegetables to produce more than 40,000 bottles of all-natural marinades, barbecue sauces, mustards and salsas… right on the farm. A new form of farm is becoming more and more visible. Under the umbrella term “micro eco-farm,” they thrive from urban backyards to small acreage, and their pioneers are finding ways for them to prosper in our new century. Indeed, we do prosper because of these farms. For as they gain ground, the earth is being restored. “In the past four and a half years,” said Robert Farr, “we've seen our holistic farming practices dramatically increase the bird population.” Each year, along with local wildlife, the land beneath these farms grows richer, and holds and filters more water instead of becoming more depleted and causing more polluted water run-off. These farms are well worth discovering and supporting (if not starting one of your own). 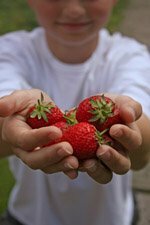 These trends include the Slow Food Movement, the grassroots groups finding ways to reconnect children with the earth and their food sources; the expanding compassion for the environment, an increasingly health oriented society, and humanity’s new understanding of the value of strong local economy and food production. They're also fueled by what some might call enemies of small local eco-farming. 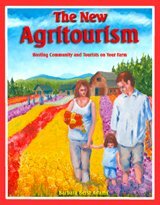 As GMOs become more threatening, non-farming citizens who never used to think twice about farms are now advocating and supporting the return of both urban and countryside small farms. Along with this, a mysterious innate human desire to eat directly from a garden seems to be a powerful force. Long ago, neighboring farms’ fruits, herbs and vegetables were picked at their prime and so tender they’d melt in your mouth… but they didn’t ship and hold up in storage well (they didn’t need to). With neighboring farms around every corner, hundreds of locally adapted and very tender varieties flourished across the land… thin-skinned aromatic tomatoes that grew from Florida to the Northwest, blueberries adapted from the north to the south, and strawberries—aromatic and melting—for every backyard. Baby carrots, hand-dug, brittle and sweet, dozens of potato varieties in a rainbow of colors and textures were part of the treasures of the land. When we went to centralized corporate agriculture, the hundreds of locally adapted varieties that had been chosen over generations for flavor gave way to a few types that grow in those particular centralized regions and ship well at the expense of tenderness, freshness and flavor. But, as described in the book, Micro Eco-Farming, enough of us have insisted on a return home. The local small farm can now supply the tender versions again, since theirs more often go from harvest to table without mechanical harvesting and long distance shipping of massive quantities of perishable crops. Since such farmers are not restricted to growing only one crop that must sell in a rush as a perishable commodity, they can adapt and grow with the flow of social changes and new ideas. Each farmer weaves his or her own picture according to bioregion, community, and the farmer’s personality, and the image changes continually. That’s what makes them so valuable. The new micro eco-farms fill spots of land from less than an acre to small-acre parcels. World travel and the internet have allowed them to discover and merge the most remarkable historical and cutting edge small-space growing methods, from French royalty to Chinese intensive to new American methods, and apply them to farms producing more per square foot than at any other time in history, an opportunity not available to their forefathers and mothers. In some cases, the farms are the sole income for both spouses and their family. They may also be the second household income for one parent, a single person’s sustenance, or an addition to a home cottage industry such as goat cheese-making workshops or weaving natural fibers from the mini-farm’s satin Angora rabbits. The canvas of their land flows and evolves along with the earth and humanity with a new display each season. Since they operate more like gardeners, entrepreneurs and artists than agribusiness, they do not invest hundreds of thousands of dollars into combines and chemicals specific to one huge monocrop that at one time almost ended the beauty of living in the countryside. Instead, they can add a few new herbs, an heirloom pepper variety, or test vintage cutting flowers in any season with the same gentle equipment they used for previous crops. They are often diverse, growing many different crops, noting which ones have more favor with their customers than others. Therefore, if one crop seems less popular, they simply don’t grow it again. No need to invest in national ad campaigns to manipulate sales of something humanity has said they will not buy, in order to pay off investments in combines and chemicals. Hopefully, the harvest moon shines down on a strengthened foundation of such farms where their growth will continue. And where both urban and living in the countryside will be abundant and beautiful again.